For the first time, astronomers have determined the intrinsic size and shape of the highly charged region of radio emission surrounding what most scientists believe to be a supermassive black hole at the center of our own Milky Way Galaxy. The new evidence may force theorists to revise their ideas about how material behaves in the vicinity of black holes. Using the National Science Foundation's Very Long Baseline Array (VLBA) of radio telescopes, an international team of astronomers from the United States and Taiwan studied the area generally thought to mark the Galactic center. This object, known as Sgr A*, and commonly called "Sagittarius A-star," is some 26,000 light years from Earth in the constellation of Sagittarius. Instead of finding something symmetrical, as expected, the researchers observed an odd, cigar-shaped area of radio emission. "If placed in our Solar System at the Sun's location, it would extend beyond Mars," says K. Y. Lo of the Academia Sinica Institute of Astronomy and Astrophysics in Taipei and leader of the research team. "But it would be only a quarter of that distance wide." The VLBA data support the current hypothesis that the central object has a mass about 2.5 million times that of the Sun. The researchers think Sgr A* may be an extremely energetic inner region of ionized gas accreting onto a supermassive black hole. "However, none of the competing models for a black hole can completely explain both the small size and asymmetrical shape of Sgr A* we have observed," says Jun-Hui Zhao, a member of the team from the Harvard-Smithsonian Center for Astrophysics. "The models would have to be changed to include some other mechanism such as a jet or wind to help explain the VLBA data." The nature of Sgr A* has been a long-standing puzzle in astronomy since its discovery in 1974 by Bruce Balick and Bob Brown. Since then, there have been many theories about the structure and emission mechanism of Sgr A*, but, in the past few years, astronomers have found increasing evidence that it is a supermassive black hole. The team of astronomers used the VLBA to determine the structure of Sgr A* at five radio wavelengths (6.0, 3.6, 2.0, 1.35 cm, and 7 mm). At long radio wavelengths the radiation from Sgr A* is seriously blurred due to the scattering by the interstellar electrons between the Galactic center and the Earth. But, as one moves to shorter wavelengths, the scatter -- or distortion -- decreases exponentially, thereby creating increasingly clearer images. Indeed, at the shortest wavelength of 7 mm, the scattering effects are finally small enough to reveal the true size and shape of Sgr A*. For an object of 2.5 million solar masses, its Schwarzschild radius -- or outer edge of the "gravity well" from which not even light itself can escape from the black hole's pull -- would be only about 7.5 million kilometers. That distance translates into only a twentieth of the mean distance between the Earth and the Sun -- an extraordinarily small area. The astronomers are particularly intrigued that the radio-emitting area immediately surrounding the event horizon has an elongated shape. The VLBA, a series of 10 individual telescopes located at sites across North America, can create, in effect, an enormous single telescope with an aperture thousands of kilometers wide, thus providing the resolution necessary to probe the relatively small region at the core of our galaxy. "We needed to be able to resolve very fine detail in order to determine Sgr A*'s size and shape," said Paul Ho of the Harvard-Smithsonian Center for Astrophysics. "The only way we were able to find these exciting results was through the excellent data we received from the VLBA." The VLBA is an instrument of the National Radio Astronomy Observatory, a facility of the National Science Foundation, operated under cooperative agreement by Associated Universities, Inc.
Left-bottom: The ten stations of the VLBA distributed over the US territories. Right-bottom: The Very Large Array (VLA) image of the ionized gas near Sgr A* which is accreting onto the supermassive black hole. Credit: Jun-Hui Zhao and W. M. Goss. 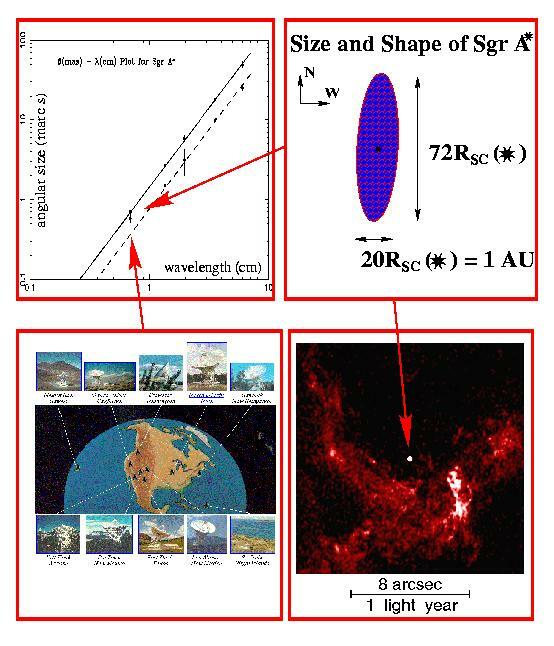 Left-top: The plot for the measurements of angular size versus observing wavelength for Sgr A* observed with the VLBA. Right-top: The intrinsic size and shape of Sgr A* derived from the VLBA measurements.